If you have some valuable items don’t worry we wont overlook or de-value them. 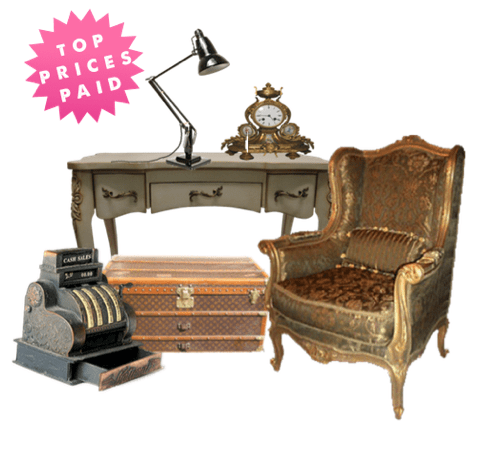 We buy lots of items from our clients, from singular items to the entire contents of a house. We take away all of pain, hassle, effort and risk involved with selling at auction and in most cases the prices we pay are better than what can be achieved at auction, especially when you take into account the commission fees, lotting fees, VAT and the transportation fees the auction house will charge you, and that’s not including the time and effort involved to manage everything should your items actually sell at auction. All of our valuations are fair and in line with market values. As we see a great many things, we aren’t always able to give an on the spot valuation, however we will make every endeavour to get back to you within 48 hours with a honest and realistic valuation. We always buy items with a purchase order which can be agreed over email, we never do on the spot cash deals. The quickest way for us to give you a free valuation is to email your photo’s to hello@surreyhouseclearances.co.uk or send pictures by text/WhatsApp to 07596 842380. We buy all manner of good quality items, below are some of the things we regularly purchase. If we are conducting a house clearance on your behalf, we would usually view the items prior to the clearance either in person or via photos over email or Whatsapp. When a price has been agreed we will raise a purchase order and send you the money via a bank transfer. We also purchase individual items from which can be a great way to make some space, raise some capital or simply have a change around to usher in the new.